Do you find yourself nodding in agreement when ads on radio or TV ask if you want a fulfilling marriage, better relationships with your children, a safer society, warmer friendships and more money? After all, who doesn't want those things? The problem is that what seems to be the magic solution one year is passe' the next. Self-esteem is in; self-esteem is out; this politician will solve the problem, but then he doesn't. What's a person, or society, to do? How about relying on those things that never change? Like God's Word? In "The Gathering Storm: Decoding the Secrets of Noah", Rabbi Daniel Lapin will astound you with a traditional Jewish analysis of the events leading up to the Flood. Beginning with the verses that list the ten generations between Adam and Noah that are so frequently skipped over, and following the tale through Noah and his family's rescue, you will be amazed to discover practical life lessons that you can apply immediately. 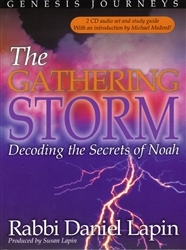 As you navigate the stormy currents of today's times, what could be more important than understanding what brought society to a catastrophic end and what unique traits Noah possessed that led to not only him, but his entire family, being chosen to survive? Even with no Hebrew background, you'll discover that there are no superfluous words in the original God-given Hebrew Bible. See how your new knowledge will change the entire meaning of a verse and how the different names used for God in different places act as divine clues to help you understand what is really going on. Even if you cannot read or comprehend a word of Hebrew, Rabbi Lapin will gently guide you through this portion of Genesis, using his exceptional blend of humor and wisdom. Listening to this CD set will give you insight into human behavior that will allow you to make sure that your faith, family and fortune thrive no matter how stormy it gets outside.